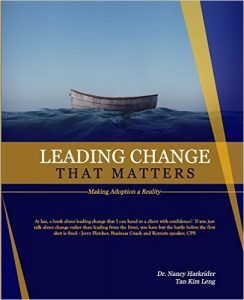 Leading Change That Matters is the book that started it all. It is framed in stories of successful change implementation. It will make you think about the long view. It will make you and those you empower truly effective leaders. It will equip you with process oriented people centered strategies. Everyone involved will learn to “lead from the front”.